life if you knew the weather months in advance? Try it Now! Welcome to weathertrends360, a complete, global, web solution to help retailers and suppliers capitalize on the weather and its influence on sales and marketing plans up to a year ahead. 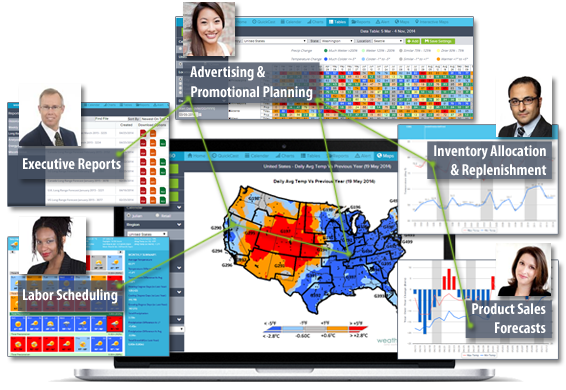 Learn how to become PROACTIVE vs REACTIVE with the weather in every phase of your business - how much inventory to buy/produce, where to allocate more/less, when to run weather-optimized advertising/marketing campaigns - weathertrends360 can help you determine all of this in minutes! 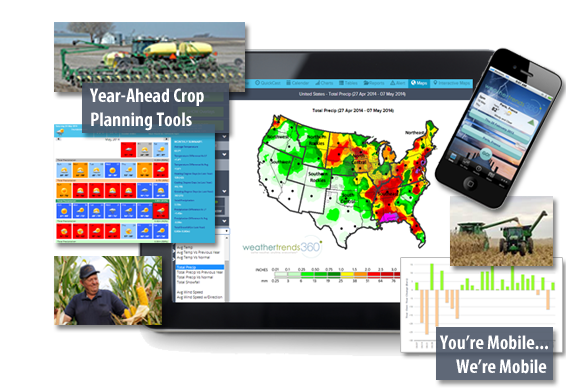 weathertrends360 takes crop planning to a whole new level with year-ahead weather guidance as detailed as your field to help eliminate many of the surprises and headaches Mother Nature brings in the months ahead. Of course, we also have the short-range and severe weather alerting tools to keep you one step ahead of the weather. See what small and big farmers have to say about our service. weathertrends360 for small businesses allows you to plan like a Fortune 500 company. Let's say you have a car wash business and the forecast says it's going to be the warmest/driest March in 10 years bringing a 125% increase in sales - are you ready? Enough chemicals? Enough labor? Or it will be the snowiest in 20 years and sales will be off 60% - Will you be overstaffed? Overstocked on supplies? We can help reduce the guessing game with Better Business in any Weather®! The weathertrends360 team of retail and business experts have analyzed weather's influence on thousands of seasonal categories and dozens of weather-sensitive equities. Our past- and quarter-ahead guidance is used by many buy- and sell-side analysts on Wall Street to get in front of earnings season. Reports are sent via e-mail, and monthly conference calls with WTI executives help you make more informed decisions before earnings are released. weathertrends360 has developed a suite of tools tailored for golf courses. How has weather affected the bottom-line financial performance of a course? What weeks and months are favorable for adding and removing seasonal employees, planning events, aerating, and seeding? These tools combined with our 11-month ahead forecasts, robust 25+ year historical database, and traditional 1-14 day forecasts give course operators more actionable information than ever before. Independently audited accuracy for both short-term and year-ahead forecasts for temperature and precipitation. A forecast Weather Trends issued one year ago is more accurate than every other weather company's 5 to 14-day forecasts. Click to view accuracy video. University of Miami and West Point PhD Climatologist's prove WTI's year-ahead forecasts are several times more accurate than NOAA - DOWNLOAD REPORT. To create an accurate year-ahead forecast, we had to let go of the traditional, physics-based meteorological model, which barely offers an accurate 7-day forecast. We analyzed 150 years of worldwide weather data and discovered a powerful relationship between water cycles in the ocean and seas, and weather outcomes. The algorithms we built are our secret sauce. Our clients love us. Over the past 17 years we have provided accurate and actionable weather intelligence on 1000's of seasonal categories, equities and commodities, yielding over $1 billion in ROI for our clients. wt360 makes planning any advertising or marketing campaign more effective around favorable weather by zip code, store, DMA, region or country levels. You can't convince someone to put fertilizer on the yard in March when snow is still covering the ground - that's poorly-timed advertising! Spend your advertising dollars more effectively in the RIGHT WEATHER 84% of the time; planning off last year is less than 20% right! Advertising in the right weather yields exceptionally higher sales, while price promotions in unfavorable weather give the consumer a reason to buy when they're not inclined to do so. With wt360's 'Power of 1 Degree' rule of thumb you can know specifically how much sales will go up or down day-by-day/week-by-week seasons ahead for Better Business in any Weather®! We have domain knowledge on thousands of seasonal categories and we can analyze thousands of your POS categories against past weather, store-by-store, in minutes. From there we can project how your sales will trends by day, week, month or seasons ahead for any geography in the world. wt360's year-over-year forecast charting tools for any geographical aggregation (store, zip code, DMA, DCs, city, region, country - everywhere in the world) out 11-months makes it easy to anticipate when sales will decline and peak days, weeks, or months ahead. Knowing your 'Power of 1 Degree' rule of thumb for seasonal merchandise category sales makes it easy to estimate demand with one simple chart. Need to know when there will be 3 dry weeks for a promotional event or harvesting a crop? Well that's easy too! wt360's 23-year trending tool puts the forecast for any geography into perspective to help explain past sales results or predict future sales. If it's going to be the coldest January in 20 years, you can safely change the planned markdowns from 50% to 40%, or even less, and still have strong clearance sales as weather drives consumer demand for seasonal merchandise they must have. You just added 10%+ to your bottom line by knowing in advance just how favorable the weather will be! Conversely, if the weather is extremely unfavorable for sales, you may want to consider giving the consumer a price incentive to buy something they don't perceive needing. wt360's location planning calendars go back to 1992 (historical data) and out 11 months to help determine when more or less labor should be planned based on favorable or unfavorable weather conditions for your products or services. Better anticipate disruptions to logistics and shipping due to severe snow or storms. Calendars also show the change in temperatures from last year or average, and when combined with the 'Power of 1 Degree' rule of thumb, it becomes easy to anticipate demand spikes for any location in the world! Our team of professional retail sales, ag and business weather experts help you decipher the weather information into SIMPLE, actionable, and profitable business strategies. We produce hundreds of reports providing winning suggestions on what actions you could take today, next week, next month, or next year for anywhere in the world. Reports are delivered in PowerPoint, PDF, or Excel via e-mail and are always archived in your web portal reports tool. We know you have a life too so now you can plan life's important events with a little less weather risk. Planning the annual vacation and want warm/sunny weather? Don't leave it up to chance when you can stack the odds in your favor with our simple-to-use temperature and sky condition trend charts? Going on a golf vacation or cruise of a lifetime? Check the best periods for great weather anywhere in the world (6.4 million locations to be exact) before you book that trip! And there are mobile apps too (wt360Pro and wt360Lite) for iPhone, Android, Kindle Fire and Tizen. wt360's equity summary report for more than 60 major firms helps Wall Street decode just how much influence weather is having an impact on a retailer's bottom line every week. If it's been the coldest/snowiest quarter in 37 years, you better expect a surprise with earnings, housing starts and many other areas of the economy. With wt360 you'll know about this months before anyone else. Monthly conference calls with our C-level retail experts eliminates the surprises and guesswork of a firm's health. wt360's table tool can generate a cooling degree day (CDD), heating degree day (HDD) and growing degree day (GDD) forecast or history for any time frame, any geography, anywhere in the world. Data is displayed in day, week or month formats up to 11-months ahead. Export the data in seconds to Excel; have the data pushed to you via FTP or e-mail; or pull it directly from our API. wt360's maps come in all shapes and sizes from flat earth maps and interactive maps to global views. They're updated every minute. wt360's quick-cast weather is great if you just want a quick peak at the next 12 hours and week ahead. We call this boring weather but at least you'll like it without any annoying advertisements! Plus it's global down to every inch of the planet. Use that little spinning globe to launch a Google map selection tool and drill all the way down into any spot on the Earth, including oceans and islands. Details on temperatures, rainfall/snowfall amounts, winds, humidity, and even things like your UV index. Sun rise/set, moon rise/set, and phases are also provided to give you a one-stop shop for all the things you need to know. With wt360's custom alerting tool you can be alerted to just about anything and everything weather. Want an alert the second the forecast shows 3" of rain or any amount - you got it! Want an alert to temperatures below 28F with clear skies - done! Want an alert with temps over 80F, but under 90F, with no rain - easy! Want an alert for 6" or more of snowfall - get the shovel ready! Of course, we'll alert you to the obvious tornadoes, flood and severe weather events as they happen. wt360's 11-month ahead forecasts help take the guesswork out planning for the weather's influence on day-to-day operations and maintenance scheduling. A week of increased rainfall during a peak playing time could mean soggy greens, less rounds played, and higher maintenance costs. Planning TODAY for the weather still months away will help your course run more efficiently and be more cost-effective. Do you know how weather impacts golf playable days or golf playable rounds at your location? 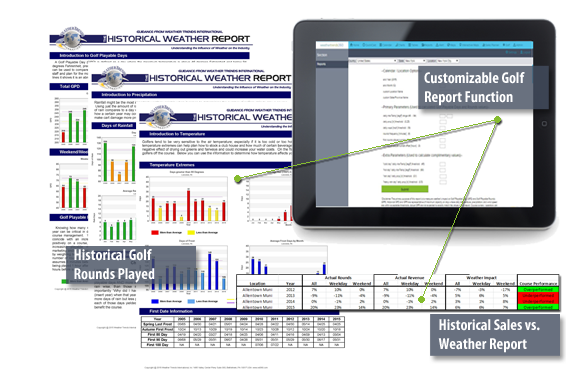 Well now you can with wt360's customizable Historical Golf Rounds Played Analytical Tool. Using either the recommended thresholds or manually entering parameters you feel better suit your course (including temperature, precipitation, wind speed, round frequency, etc), you get a location-specific analysis of how weather has affected golfing at your course. Determining, financially, how your course performs in relation to the weather is a necessary tool for any successful course. By simply uploading daily, weekly, or monthly revenue (or rounds) data into this analytical tool, wt360 can calculate the year-over-year change in rounds played, revenue, and weather's impact on the course. Our easy-to-read output will tell you whether your course is over or underperforming when it comes to the weather. Farmers need to maximize yield. Weather Trends' forecasts and planning tools deliver the information you need to plan ahead. Based on wt360's forecast of the coldest/wettest summer in 5 years I sold my corn very early in 2014 and netted $120,000! I am pondering if I should promote your company and your long range forecasts (I absolutely LOVE IT) or just sit back and look like the smartest farmer in north central Texas. I would not go out on a limb planting the acres I do without you guys. I really like what I get from wt360. It's great for farmers to help them decide what to plant and when to plant it but also good for risk managers and the critical decisions they make. I've been using wt360 for 10 years with great success. Manufacturers need to know how much to make and when to promote it. Weather Trends delivers answers to both. "Using Weather Trends' forecasts, we worked with retailers to get more product on the shelves at just the right times, and the financial win has been big." Small businesses need to know how much to buy or make and when to promote it. 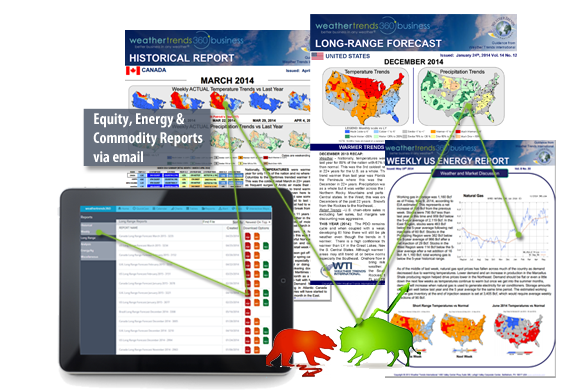 Weather Trends delivers that knowledge with 11-month ahead forecasts. "Can forecasters really predict the weather a year from now? weathertrends360 not only does it but does it well. They have saved us and our clients thousands of dollars. It is your commitment to your customers and superior forecasts that will keep us a loyal weathertrends360 customer year after year." Retailers need to know how much to order, where to distribute it, and how to promote it. 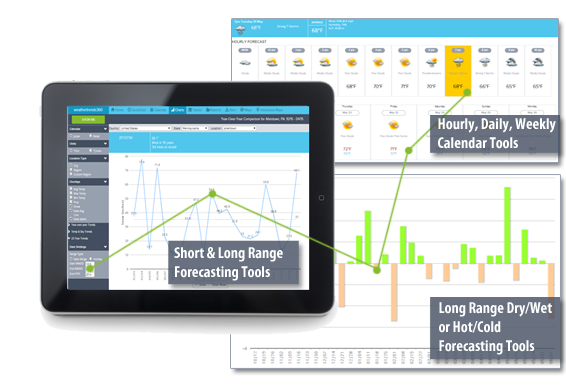 Weather Trends sales analytics and sales planning tools guide you through each critical decision. "Weather Trends helped us make billion dollar marketing decisions. We time our marketing in sync with the weather to help us get the right message in front of customers and stock the right amount of merchandise in stores." Investors need to know when to buy and when to sell. Weather Trends knows the trends before they start. "Weather Trends has proved to be more accurate than Earthsat, WSI, The European Model and any other service we've tried." The service industry needs to know how much demand to expect and when it's the right time to invest in new equipment. Weather Trends predicts demand accurately, allowing you to make decisions with confidence. Services like Beverage Distributors, Lawn and Garden Services, Air Conditioning Contractors, Car Washes, Restaurants, Snow Removal, and many more can make critical decisions months in advance. The golf industry needs to know how to plan for the upcoming season, understand how weather has affected their bottom line in the past, and react to sudden changes in the weather in the 1-14 day range. weathertrends360 can provide this complete weather package to all sectors of the golf industry.